Julia Van Raalte reviewed the 15/16 Hoji W last year and Jason Hutchins spent time on the Hoji prior to that. Check out their reviews for a description of the Hoji line as well as details about the design and construction of the skis. 4FRNT positions the Hoji W as a versatile tool for ladies that charge. Julia concluded that the Hoji W is a light and playful directional ski that responds well at high speeds. She found that they perform best in soft snow and can get thrown around in crud and chop, but are capable of holding an edge in firm snow. I am a slightly more upright (neutral stance) and playful skier than Julia due to my background in freeride skiing instead of racing, but I still spend most of my time arcing fast turns down the fall line. So I was excited to see how the Hoji W held up as a big mountain charger that likes high speeds while allowing for a more playful touch than many directional skis with metal, such as the 2013-2014 Blizzard Cochise. Any soft snow does make the Hoji W really come alive. I was only able to ski a few 6-inch storm days on them, but it is obvious that these were designed to be agile in fresh snow. Tasha Heilweil on the 4FRNT Hoji W, Alta, UT. Once the Hoji W is up to speed, it is easy to bounce from pocket to pocket, throw slash turns into soft pillows, and fly through tight, playful lines. I could definitely see making the Hoji W part of a 2-ski quiver, alongside a damper ski that has more traditional sidecut and less rocker for firm days. I spent my first couple days on the Hoji W in firm snow at Arapahoe Basin, where I started off with a couple of groomer runs to get my feet under me. My impressions of the Hoji W were very similar to Julia’s: they are very stable while holding an edge through large GS turns, but they are not going to win any awards in the carving category. Their sidecut (or lack thereof) actually works well with the rocker profile to allow for a nice, even turn radius when the skis are on edge. The relatively soft tips don’t chatter too much—even on icy, bumped-up groomers when the skis are engaged in a turn. As Jason mentioned, when running bases flat along firm groomers or smooth windbuff, the skis sometimes act unpredictably due to the full rocker profile. But within a few runs, I was able to adapt my skiing to transition quickly and pop from one turn to the next, which made all unwanted sliding and pivoting disappear. After confirming that the Hojis are fine for getting back to the lift but aren’t the ski to take out for a day of carving, I hopped on the Pali lift. 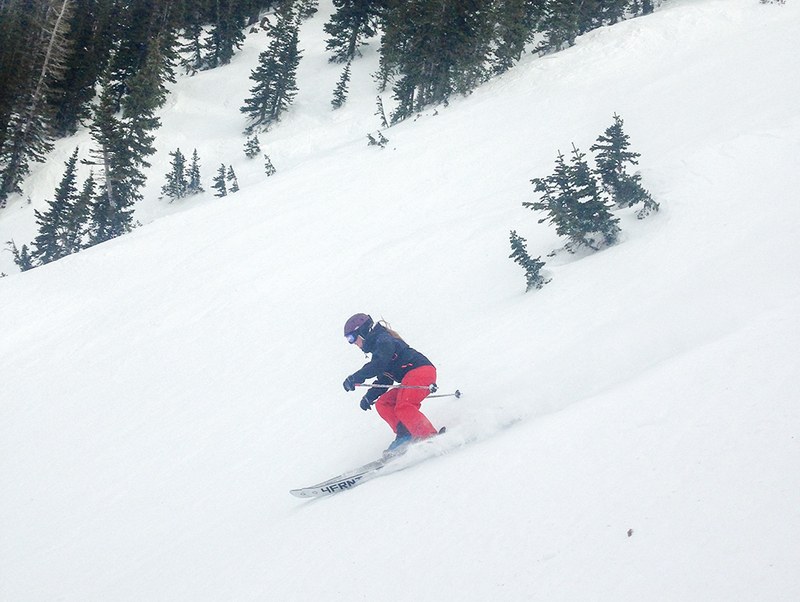 Most of A Basin was covered in firm, edgeable moguls, but there were some windbuffed stashes to be found. 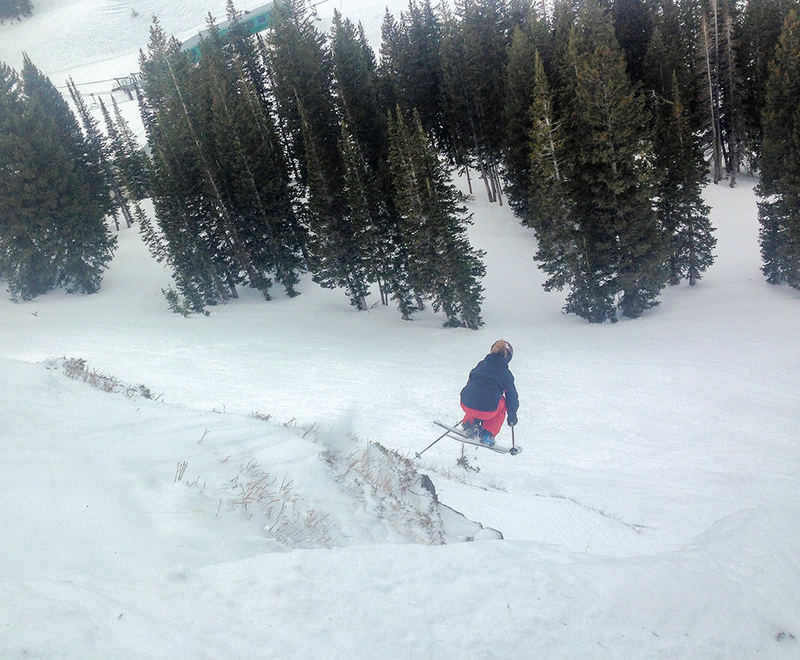 Skiing moguls on this 112mm-underfoot, 30-meter-radius ski was more fun than I expected. The 179 cm Hoji W is the longest ski I have ever been on since I am 5’2” and usually choose skis between 170 and 175 cm. I was concerned that the length paired with the relatively forward recommended mount line (compared to other directional skis like the Cochise) would cause me to have a hard time smearing the tails around through moguls. But thanks to its full rocker profile, the Hoji is easy to release the tails to turn quickly through steep moguls and trees, or to line up a tight air. The Hoji W has a harder time skipping across and gapping over moguls than my 170 cm, 13/14 Cochise. As I anticipated, the soft tips fold up or get deflected in awkward compressions rather than barreling through them. This also happened in firm chop and crud. I found myself almost going over the handlebars in snow that the 170 cm Cochise would bust through without a problem. I felt more balanced on the Hoji W when I stopped driving into the front of the skis and went for more of an upright stance. So if you often ski crud and prefer to / insist on driving the shovels of your skis, the Hoji W isn’t the ski for you—or at least not as a 1-ski-quiver. The Hoji W’s tails are moderately stiff and extremely supportive. I had an amazing time landing on firm, punchy, and soft snow on the Hojis. I occasionally shifted backseat to prevent myself from going over the handlebars, but I was always able to recover thanks to the stability of the tails. On my 8th day skiing the Hoji W one ski split under the heelpiece with the topsheet coming off from the wood core on one side. Julia Van Raalte was on this same pair for 12 days last season, but in total they’ve only been on snow for about 20 days. I actually don’t know exactly when it happened. I noticed sometime in the afternoon one ski seemed to be less stable and chattered more through hard snow. I’m guessing that it broke when I almost punch-fronted out of a 15-foot air—I somehow pulled the landing off and was actually surprised that the tips provided enough stability to keep me from being thrown over the front, but it must have put a lot of force under the heelpiece. That being said, I never crashed hard or should have released from my bindings while skiing the Hojis. So this could have been a fluke, but figured it was worth reporting. The 4FRNT Hoji W is a playful directional ski that can handle most conditions, but shines in soft snow. With a little speed, they carve through hardpack and float in powder, but can easily be broken free into a smear or slash turn. In the air the Hoji W are light and the stable tails make landings easy.